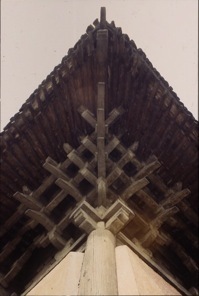 remarkable bracket sets staying wide eaves. 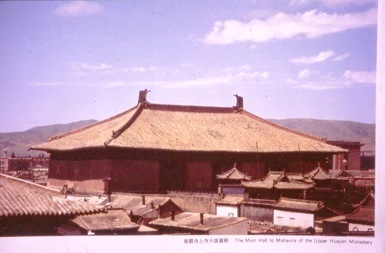 The temple halls rise above all the houses around them. You glimpse them from miles away and they seem like giant dinosaurs caught in a time-warp. ed. 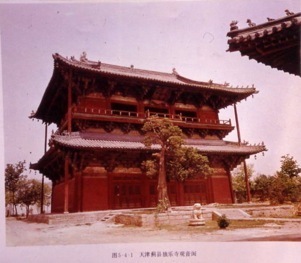 Li Yuming, A Panorama of Ancient Chinese Architecture in Shanxi, Taiyuen, 1986, Shanxi People’s Publishers. is common for statues and door guardians to be much taller than doorway height. Their heads almost graze the rafters, and their imposing size makes us mere humans feel puny and mortal. The main temple has survived 34 major earthquakes. 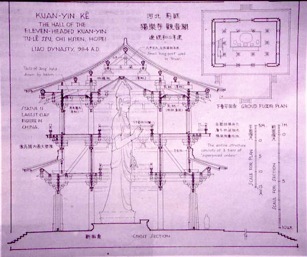 We see beams and eaves sag because the temple builders pushed the timbers near their limits. Hence the wood posts which now prop up the roof corners.